Though much maligned, getting home from work and having little time to cook can often force you into coming up with some delicious meal ideas. Simple and usually relatively frugal, these recipes are among the most satisfying to develop and jot down. I love the mid-week “make do with what you have lurking in the fridge” attitude; it can really give you that creative spark you wish you’d had the weekend before. 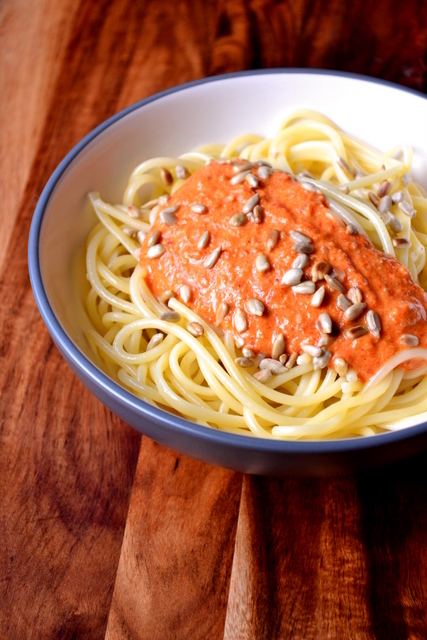 This recipe for Red Pepper and Sunflower Seed Pesto is a perfect example of that. After all, aside from a portion of spaghetti it only contains 4 ingredients! There’s one thing I hate about regular pesto. One thing that grinds my gears – pine nuts. There, I said it. Yes, they’re delicious, but boy are they expensive. At an unbelievable £3/100g, it’s a wonder anyone buys them at all. I mean, when you can buy 200g of sunflower seeds for 99p – six times less – and still come up with an incredible pesto the mind really does boggle. As you can see from the recipe below, this pesto is somewhat unparalleled in it’s simplicity. You’ll find no parmesan here. While I’m sure some will no doubt decry my use of the word pesto in this case, lightening things up a little makes for a rather enjoyable accompaniment to pasta. The flavours of the extra virgin olive oil, roasted pepper and toasted sunflower seeds really shine through and you don’t feel like you’ve taken on a million calories in the process. 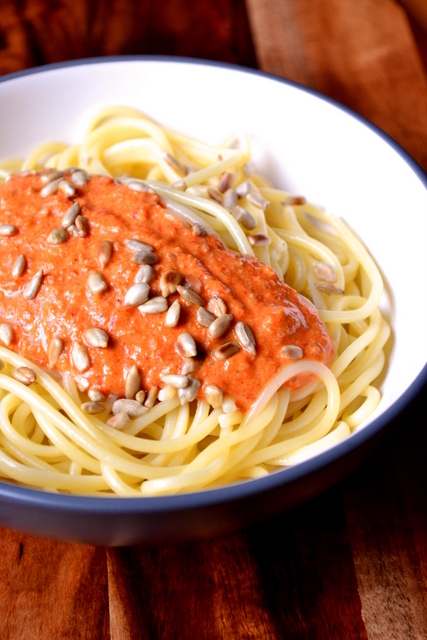 This recipe for Red Pepper and Sunflower Seed Pesto really is a winner. Heat your oven to 220C/200C(fan). 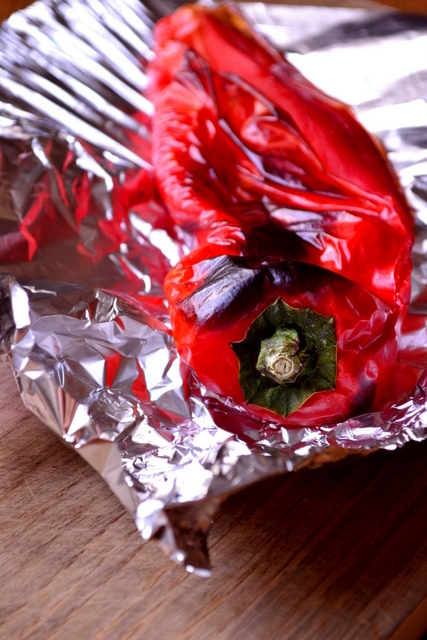 Pop your pepper on a baking tray and cook until turning black. After the pepper has been cooking for about 10 minutes get your pasta on the boil in some salted water (if you intend to eat the pesto immediately). Once cooked, remove all of the skin and seeds from your pepper. Roughly chop it and transfer to a food processor. Gently toast your seeds until turning brown and throw them bodily into the food processor. Along with the oil and salt, whiz the pepper and seeds until smooth. Drain your pasta and serve with a dollop of the pesto and a few extra sunflower seeds scattered on top. Cost: As mentioned above, sunflower seeds are rather inexpensive. Even allowing for those scattered atop the pasta dish, the seeds used in this recipe should set you back around 20p. As such, when all is accounted for this simple meal will cost in the region of £1.50. Sounds delicious and what a brilliant idea to use sunflower seeds instead of pine nuts. Thanks – Im not sure why it’s taken me so long to try it! I can’t wait to try this pesto. I make a sauce with peppers and almonds that I like so I know that the sunflower and red pepper combination will be very good. Ooooh almonds sounds fantastic- I’ll have to give that a try. I’ve used walnuts before. I was moaning just the other day about the cost of pine nuts so what a great idea to use sunflower seeds! I don’t know why I’ve never thought of this before. It suddenly came to me, not sure why it took me so long to be honest! We all seem to be ‘playing the same tune’ looking at this marvellous take on pesto and wondering how soon we can get into the kitchen to make it! I have still been the dumbo who shells out for the pine nuts never ever thinking of that bag of sunflower seeds sittting in the same pantry tray! Have not used red peppers either . . . supper tonight for sure!! Thanks ahead of time!! Indeed! I hope you enjoyed it – it’s such a delicious pesto and very simple! This looks really good, what a clever idea. Just made this with the addition of garlic and more olive oil (for consistency), and returned to the pan with fried bacon pieces. Then tossed through the spaghetti along with grated parmesan and dried chilli flakes. Yum. I can see why! I can’t wait to make it. I’m a huge fan of most pestos. Me too – can’t get enough! Sounds mouth-watering! And I do have a big bag of sunflower seeds at home… A pity peppers aren’t in season at the moment but it is a thought to hold on to. Yes – I usually wouldn’t do an out-of-season dish – but there were some really cheap, good-looking peppers! Woah, so simple but beautiful! Thanks – I’m loving simple food at the moment. This was delicious! My husband loved it, and thought it would be wonderful to serve to guests. The sauce could be used in a lot of other dishes, as well. Thank you! Absolutely, one of my favourite pesto recipes!